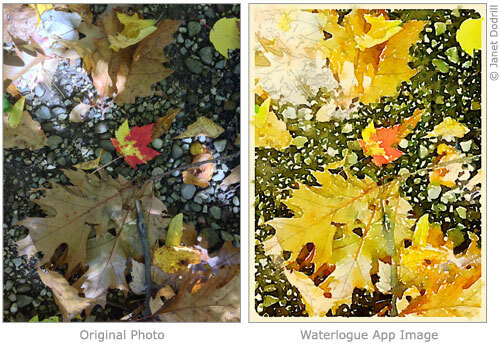 Have you heard of the iPhone and iPad app called Waterlogue? 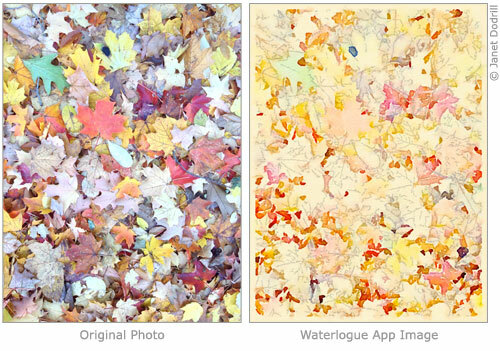 The app converts your photos into beautiful watercolor-like images. It is published by Tinrocket, LLC and was co-created by John Balestrieri (Tinrocket, LLC) and Robert Clair (Chromatic Bytes, LLC). Available on iTunes for $2.99, it has a 4+ customer rating. It is one of my favorite art apps to use. I create custom note cards using images that I first shoot on the iPad and then run them through Waterlogue. Below are a few images (before and after) I created using various filters in the app. iPad photo and Waterlogue app image. This entry was posted on Wednesday, October 22nd, 2014 at 1:47 am and is filed under app, art, creative, digital, iPad, iPhone, photo editor, photo software, photography. You can follow any responses to this entry through the RSS 2.0 feed. Both comments and pings are currently closed.